Has anyone here ever wondered what it will be like to travel from Lipa to Manila in style? First of all, my idea of style is to be able sit on a comfortably – if not necessarily elegantly – padded seat that has a head rest that all civilized transportation seats ought to have; ride along over an even surface; have access to a magazine or – better – a mug of hot brewed black coffee or milk chocolate; and arrive unflustered and on time. We cannot be talking about driving in a car. No matter how luxurious a sedan is, one is bound to roll over some unevenness on the road somewhere – this is the Philippines, lest anyone forgets – and encounter the inevitable build-up of traffic as well. Therefore, we can all kiss unflustered and on time goodbye. Lipa to Manila by light plane is half an hour; but it is not style. We cannot also be talking about commercial aviation because I cannot see how a Lipa-Manila air route can be financially viable. 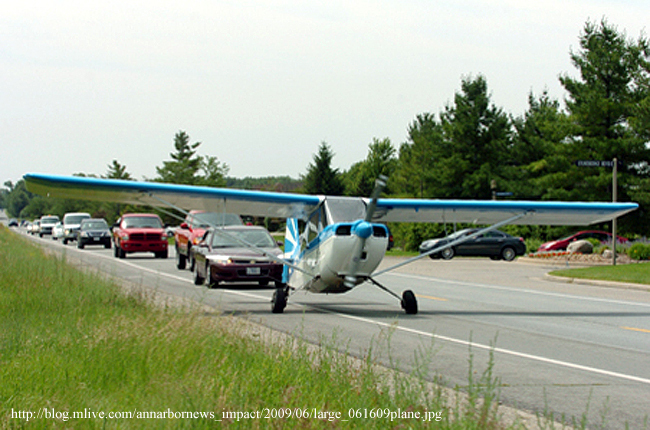 It is a thirty-minute trip in a light plane; but then travelling in a light plane is not style. For short-range jetliners, the route is way too short; and airport check-in protocols alone render it impractical. Therefore, we can only be talking about a train ride to Manila, something that used to exist just in case anyone is incredulous. In fact, the term riles as used to refer to the informal settlers behind my beloved football field is a throwback to the days when – indeed – there was a railroad track instead of shanties. The track used to go all the way to Batangas City, which once upon a time was connected to the capital by way of a railway system. It used to intersect the national road close to where the old Tambô parish church used to be; and a few yards from that little side road that leads to Lodlod. Image credit: Batangas Railways. Posted by user Pinai on the Indonesia v the Philippines discussion board on www.city-data.com. Then, the track went on into open farmlands, passing behind the SOS Village in San Vicente. From there, the route ran all the way to the port of Batangas City. Some sources even hint that the line went all the way to Bauan. When I was a grade school student, we could look out the windows of the 400 wing and see all the way through to the riles. 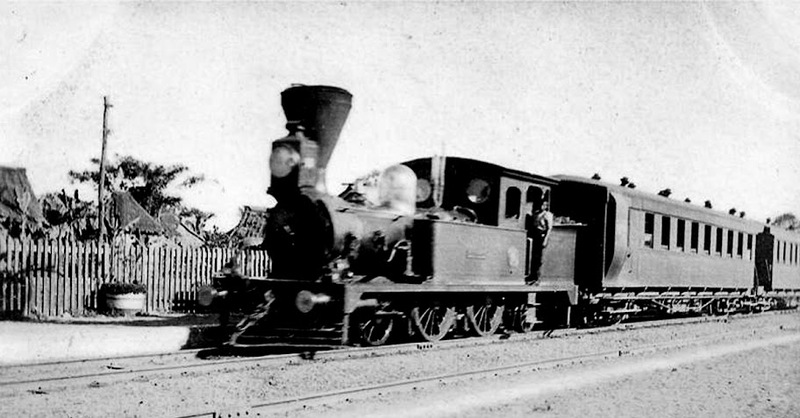 It was not unusual to see a train engine maneuvering; although the passenger trains had long gone. What we saw, instead, were trains laden with sugarcane to be ferried, I suppose, to a sugar cane mill somewhere in Canlubang. Now let us all do some elementary calculations. The distance between Lipa and Manila is 76.74 kilometres or 47.69 miles, probably shorter as the crow flies. Road distance is between 88.25 km to 95.92 or 54.84 miles to 59.61 miles. 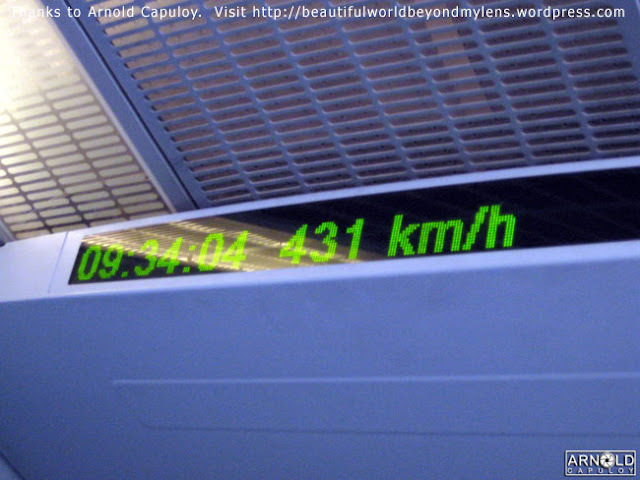 The Maglev speed indicated by the counter. Image credit: Arnold Capuloy. If my calculations are right – and I am just the blog writer, remember – then assuming that there are no stops along the way, using a standard United States high speed train capable of 201 kph, a Lipa to Manila trip can be completed in just 22.8 minutes! In one of the newer European high speed trains capable of 250 kph, the trip can be completed in 18 minutes. 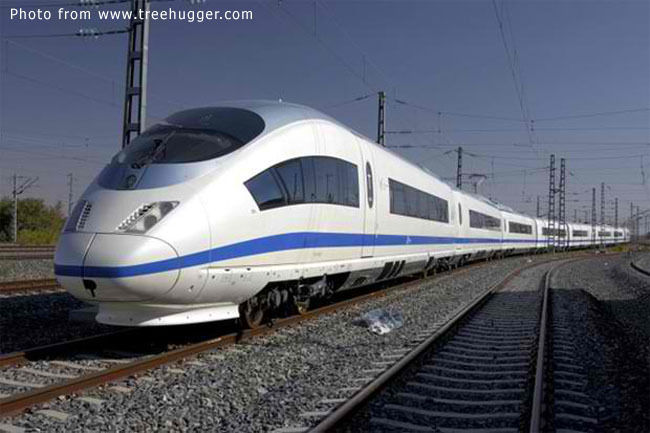 If a Japanese 300 kph bullet train is used, the trip can be completed in 15.6 minutes. 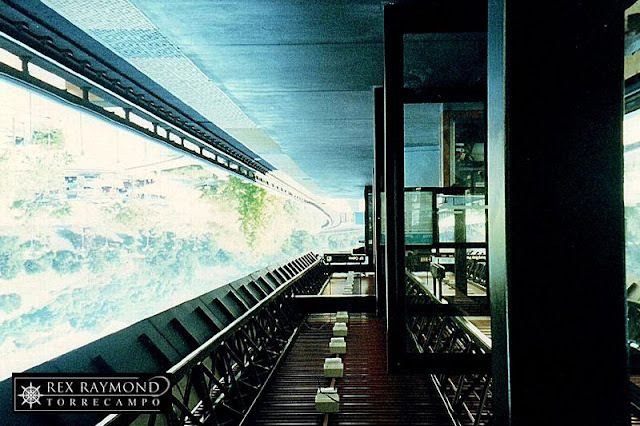 Now, using the German-engineered magnetic levitation train technology now being used by China, with trains that can run as fast as 500 kph but are commercially pegged at 431 kph, the trip can be completed in – whew! – as short as 10.8 minutes! These are all rough estimates, of course. 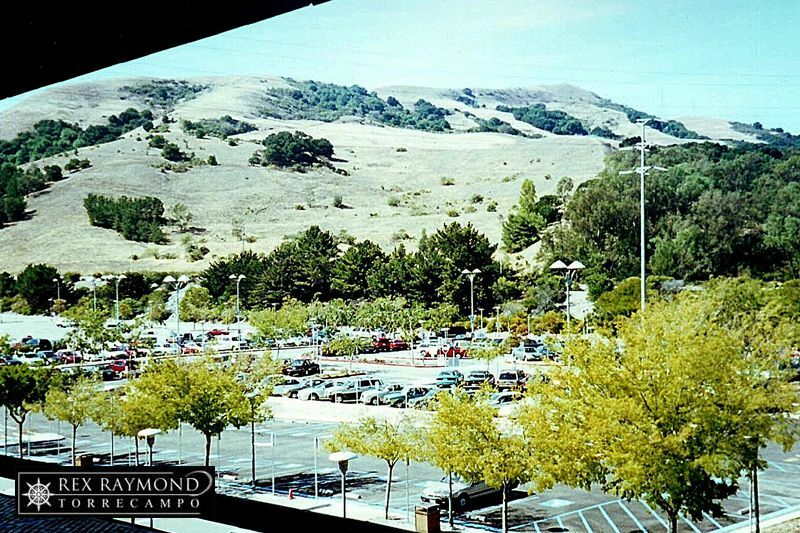 When I visited the Bay Area in California in the previous decade, I was surprised to see so many cars parked in huge parking lots right next to train stations in the suburban town where I stayed. As I later discovered, many who worked in San Francisco and other neighboring cities, rather than using their cars for the 29-kilometer drive to the city, instead took the Bay Area Rail Transit or BART to work and came back for their cars after hours for a shorter drive back to their homes. Makes sense, does it not? It saves people from the hassle of driving and road traffic and, therefore, decongests the roads. Not to mention less expensive for those choosing to commute. A California suburban parking lot right next to a train station. A station of the Bay Area Rail Transport which brings suburban commuters to San Francisco. Now to the inevitable question: will it ever? There was talk during the Marcos era and later resurfacing during the Ramos presidency that the Batangas City-Manila line was supposed to be revived as part of the development plan. Some even said that – during the Ramos Presidency – instead of reviving the old line that linked up with the Calambâ track and snaked through the municipalities of Cabuyao, Sta. Rosa and Biñan, fresh tracks for a light rail system were to be laid instead in the middle of the highways leading to Manila. Meanwhile, we can all dream on because, as they say, dreaming costs nothing. Does it just not make our eyes all gleam just thinking of how convenient it will be just to be able to leave your car behind and head for Manila seated comfortably in an air-conditioned railroad car, sipping a mug of coffee, reading the early morning paper and – best of all – knowing you will arrive unflustered and on time!